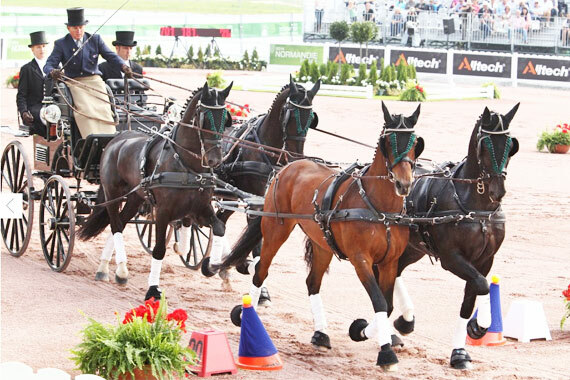 Australia’s Boyd Exell kept a clear head in the exciting final obstacle driving competition of the Alltech FEI World Equestrian Games 2014 in Normandy on Sunday and scored a fabulous clear round, securing a third world championship title in a row. Chester Weber (USA) won the silver and European champion Theo Timmerman (NED) took the bronze medal. The Dutch team won the nations competition for the fourth consecutive time, followed by Germany and Hungary. O-Course Designer Richard Nicoll had laid out a superb course at the La Prairie racetrack in Caen, in which nine of the 46 four-in-hand drivers managed to stay clear. The top nine after dressage and marathon did not change after the cones competition which attracted some 3000 spectators. Excitement grew as the competition reached the Top Ten. The German drivers all had one knockdown, but this did not jeopardise their silver team medal. Fourth-placed driver IJsbrand Chardon (NED) drove a clear round and put compatriot Theo Timmerman under pressure. Timmerman had only a 0.5 penalty point advantage to Chardon and knew that he had to go clear to secure his bronze medal. “I drove calmly through the first part of the course, but after gate 17, I suddenly realised that it was going to happen!” Timmerman said. “It was difficult to keep it together during the last part of the course, but it worked. I am also very pleased with the gold team medal. Koos de Ronde and IJsbrand Chardon did a great job today, I did not have to worry about the team results, I could concentrate on myself. It always feels good to win!” he said. Exell entered the arena knowing he had to stay clear in order to retain the world title. As the true horseman that he is, the Australian driver relied on his skills and made no mistakes. “It was a huge relief,” he said. “We had a good show throughout the weekend, but not a perfect show. The cones went really well for me although the arena was moving a lot. I knew Chester would have a clear round because he has been driving clear rounds all season. He has the best cones team and I expected this already. It is great to be the world champion again and I would like to thank my entire team for their great support,” said Exell, who is moving to The Netherlands by the end of the year. Czech team member Jiri Nesvacil jr, 33, was the first competitor of the morning to score a double clear round. Jiri, who was joined on the team by his brother Radek and his father Jiri sr, has been training with Theo Timmerman since the beginning of the season. French team driver Thibault Coudry won this final phase of the competition with a clear round and the fastest time. Wilf Bowman-Ripley (GBR) finished second, ahead of Timmerman and Exell. Young Belgian driver Edouard Simonet, a former Team Exell member, also drove a clear round with his lovely team of Arab-Friesian horses. Simonet, who is the younger brother of the French chef d’equipe Quentin Simonet, celebrated his 25th birthday on Friday. The youngest competitor in the field, 22-year-old Jozsef Dobrovitz jr., contributed to the Hungarian bronze team’s medal by driving clear as well.